Don’t accept less than perfection for your bathroom renovation. Discover Aqua-Tech’s premium suppliers. I'm Ready For My Estimate Now! 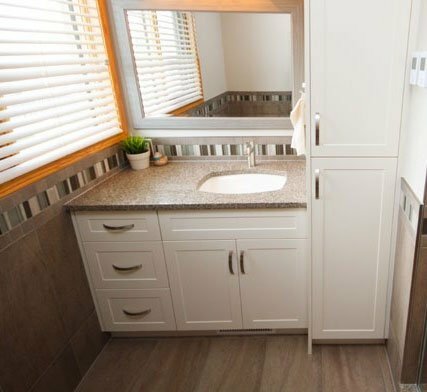 The bathroom of your dreams awaits! Get your estimate now to find how easy it will be for Aqua-Tech to create an incredible bathroom for you to love for years to come. Aqua-Tech carries products from a broad range of suppliers, guaranteeing that you’ll get the most luxurious bathroom possible within your budget. From classic American styles to modern European options, you’ll find everything that you’re looking for. To explore our craftsmanship in person, we invite you to visit our showroom—the only one of its kind in Winnipeg. You’ll find over a dozen of our fully functional vignettes to inspire you and encourage you to challenge our team to design the most unique bathroom yet. We hope to see you soon. One stop show, what more can we say. We are very pleased to show off our washroom. Request Your FREE Tour of Aqua-Tech's Bath Showroom! Discover the wealth of options available to you as you renovate your bathroom! From premium suppliers to custom options, you'll get all the inspiration you need! Discover what you can expect from your budget including in-floor heating, custom features, fixtures and more. Your dream bathroom from Aqua-Tech awaits!